When she had to give up making her daughter’s clothing, she began to do fiber art, and since she has always loved Victorian clothing, many of her works feature it. The dolls came about when she was working at a hospital in Marshall, Missouri. She became good friends with Ann Stapleton, one of the volunteers. 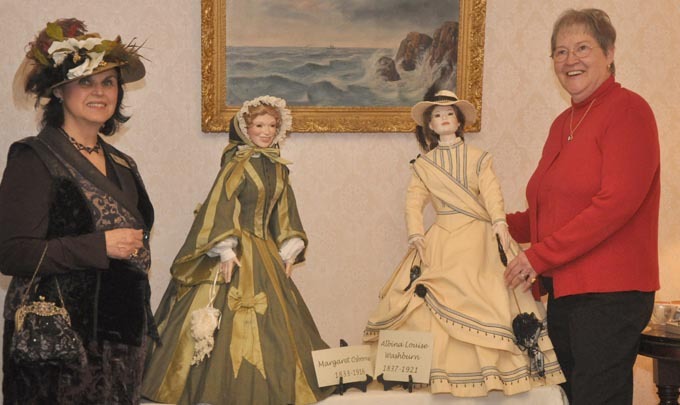 Upon seeing her fiber art, Ann suggested she make dolls and Robison could dress them. They entered the business of making and dressing dolls. 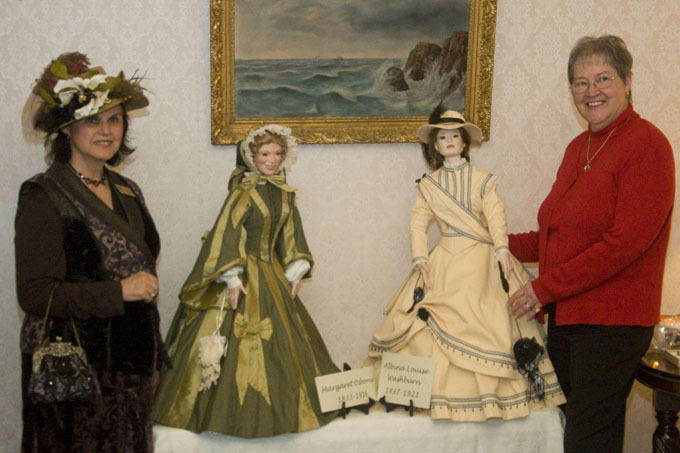 When Ann was diagnosed with cancer, Robison decided she wanted just 12 dolls to keep and dress. 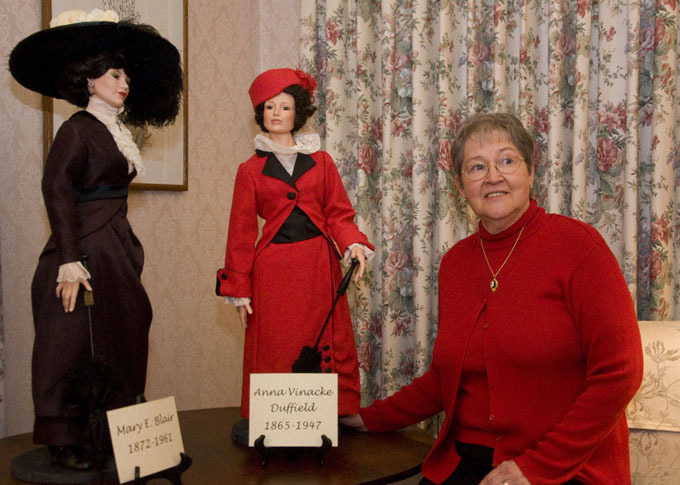 During a period of Ann’s remission, Ann created the dolls. Robison began sewing, but Ann passed away before she finished and she laments that her friend did not get to see the last three dolls. While Robison was still living in Missouri, the CEO of her hospital came to her with a large collection of Harpers Bazaar magazines from as early as 1865. His mother had collected them and he found them while he was cleaning the attic. They were quite odiferous and his wife did not want them in the house. Robison offered to sell them for him if she could keep some of the magazines. After airing them out on her back porch, she sold most of them. The treasure trove that she kept included some large posters labeled “Gigantic Supplements, Young Ladies Journal.” Printed in London, these supplements featured “the latest in Paris fashions” on the front side while the reverse featured the pattern for making the dress. Robison has included the posters with the display. Robison says she has no formal training, but seems to be able to create the dresses by looking at the pictures. The journals are a valuable resource for her work. Shortly after she and her husband moved to Loveland she called the Loveland Museum/Gallery to see if they would house the dolls. They agreed, but wanted to wait until their new addition was finished. 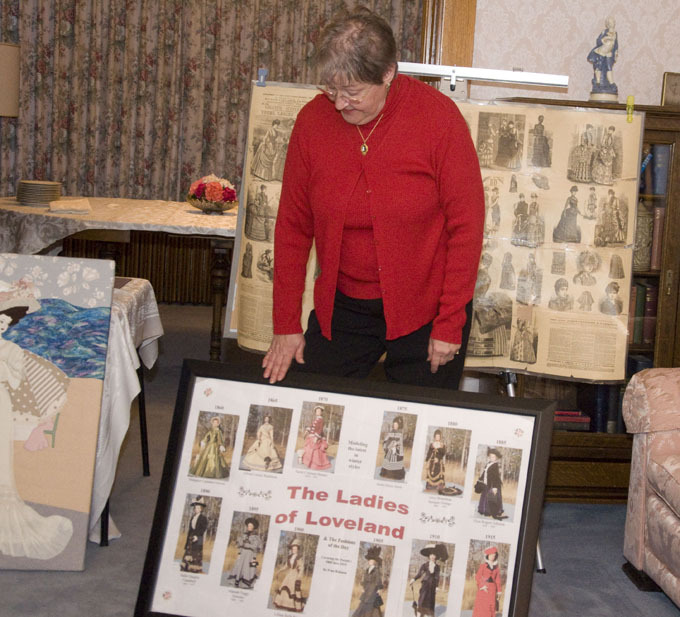 The Loveland Museum called the Berthoud Historical Society and suggested the dolls would make a nice addition to the McCarty-Fickel House until Loveland was prepared to take care of them. The dolls will be at the Berthoud historic home until December. 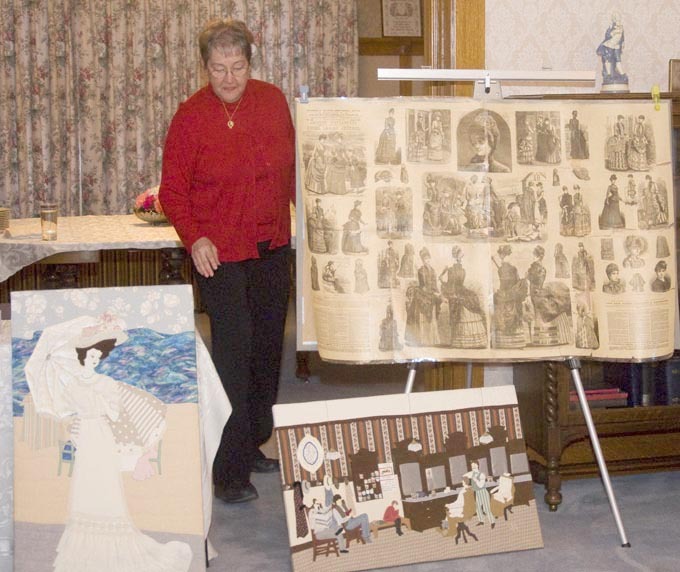 Robison has created the set as the “Ladies of Loveland” and she went over a biographical sketch of each of the women in the group. The docents at the McCarty Fickel house will include that history in their tours. Robison said that there are certainly more women who could have been include, but she only has 12 dolls. The attention to detail is amazing and Robison has carefully chosen the fabrics, including mink, for the dolls. Not readily apparent is that the ladies are also wearing a complete set of undergarments. If you want to see how these dolls are dressed underneath the fancy dresses, you can attend on June 10 when they change into their summer clothes or on October 17 when they dress for the holidays. These dolls are complete, but Robison is still hard at work. She described how she purchased a doll at a benefit for 50 cents. She dressed the doll and returned it and it sold for $180. Now she finds dolls that she can clothe and donates them to worthy causes to sell at their fundraisers. The McCarty-Fickel Home is open on Wednesdays, 10 a.m. to 4 p.m. and on Saturday and Sunday from 1 p.m. to 4 p.m., Admission charge is $5. Site contents copyright © 2019 Recorder Online	except as noted. All rights reserved. | 115 queries in 2.281 seconds.